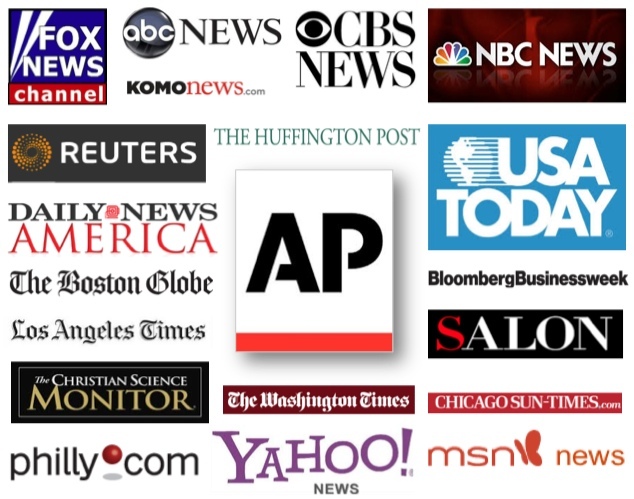 89 mainstream media outlets picked up the AP’s flawed Valley Meat coverage. Of those pictured above, only one (The Christian Science Monitor) responded to public requests for correction. A series of 18 AP news stories that repeated significant factual errors for a year and a half will not be corrected, according to AP West Editor, Traci Carl. The articles, which Ms. Carl admits were not fact-checked, followed the attempts of a Roswell, NM, abattoir—Valley Meat—to slaughter horses based on the argument that it would diminish horse abuse and neglect. But there was a problem with that premise, which correlated data showing increasing horse abuse and neglect reported by the GAO (Government Accountability Office) with the closure of the last three domestic horse slaughter plants. The AP reporter, Jeri Clausing, misreported the closing dates by a year, however, causing the correlation with the GAO data to turn on its head. Instead of showing that horses suffered abuse and neglect when domestic plants closed, the GAO data instead showed the opposite: that abuse and neglect increased during years in which the plants remained open. But despite being informed of this and other errors, the AP kept repeating them, in most cases, simply cutting and pasting the same false statements—verbatim—into successive articles. These spread virally across Bloomberg News and Reuters; ABC, CBS, NBC and Fox News; NPR; the Boston Globe, Christian Science Monitor, Huffington Post, Wall Street Journal and USA Today—and hundreds of other mainstream and smaller news providers. As of this date, only one of them—The Christian Science Monitor—has responded to requests to issue a public and formal correction. The false claim that banning slaughter increases horse abuse and neglect was a godsend for Valley Meat and other plants looking to produce horse meat in the U.S. The cumulative audience for that message easily reached into the tens of millions, including lawmakers wrestling with whether to ban or welcome horse slaughter plants into their jurisdictions. Last year, Oklahoma lawmakers argued erroneously but effectively in overturning a 50-year ban on horse slaughter that it would alleviate horse abuse. That same argument was used to defeat a proposed New York state horse slaughter ban, while farm bureaus and associations in other states used it to promote opening plants in numerous rural communities. Is it Possible to Hold the Media Accountable? The false horse-abuse-and-neglect argument wasn’t the only topic on which the AP—and the mainstream news media—misled the public. Many readers complained about other factually insupportable claims made by the AP’s main sources: specifically, Valley Meat’s owner, Rick de Los Santos; his attorney, Blair Dunn; and supporters. Beginning in June, 2012, more than 60 emails, phone calls and letters were exchanged with Ms. Clausing; News Editor Linda Ashton; Ms. Carl; Standards Editor Thomas Kent; CEO Gary Pruitt; other AP editors and executives; and the AP corrections line. Part of that outreach included a detailed timeline and analysis demonstrating that the 2007 plant closings did not line up with the GAO data. But neither that nor the accompanying letter co-signed by seven national experts on horses and the horse slaughter industry persuaded the AP to correct or retract its story. All requests pertaining to the 18 erroneous articles, including notifying news sources that had republished them, were summarily dismissed. This was odd. Making timely corrections and notifying other news sources was consistent with the AP’s mandate (see AP News Values and Principles). Besides, who could possibly contest a wrong date? Further, the AP regularly printed corrected versions of articles in which it had misreported data, dates and made minor spelling errors. So why wouldn’t it with regard to a false claim that had actual political consequences? On January, 24, 2014, Ms. Carl addressed, by telephone the AP’s reporting errors on Valley Meat. When asked why the reporter had not fact-checked her sources, Carl stated that the AP’s only duty was to “share the story” that they provided, not check them for accuracy. She further argued that data was not necessarily factual and that facts in and of themselves weren’t anything more than opinions. The takeaway was that if a source used false data to promote a falsehood—as Mr. De Los Santos, Blair Dunn and various other supporters had done—that the AP’s only duty, as Carl saw it, was to quote them and then present another source holding an opposite view. So a false date producing an erroneous correlation with unrelated data is, in the AP’s eyes, an opinion. One year ago, the AP was excoriated in a Huffington Post article (“We Deserved ‘Shellacking’ For Boston Marathon Misreporting”) for errors provided by a source that the AP admitted to not fact checking. It accepted responsibility and fell on its sword. Is another shellacking in order for the AP–and the rest of the news media—for misleading the public about Valley Meat? More to the point, if a journalist and six national experts can’t get a news organization of the AP’s stature to report factually on issues that brought this country closer than it has been in seven years to opening horse slaughter houses; if the press won’t fact check when reporting on subjects that have political consequences—then what hope is there for the news media, and the public who relies on it so heavily? If the lack of media accountability bothers you, do this: tweet this article to every mainstream news source that got this story wrong (you can also follow me on Twitter @viglet). And the next time you see an error from any news organization, demand corrections. Politely contact the reporter, their editor, their corrections department, their standards editor and if necessary, their editorial board and CEO—and don’t give up until they do something. Lord knows, the nation’s journalists work hard and do tremendous good; but their errors and disinformation are indistinguishable from the truth—and the public pays dearly for it. Filed under Animal Journalism, From my blog on Forbes.com. Thank you, Vickery. I’ll do everything I can to support you and getting the word out. I am forever grateful for your reporting on the wild horses. Please let me know if there’s anything else I can be doing to help the cause of the wild horses and burros. I’m currently on a mission to get a packet of facts and data (truthful) to every Senator and US Representative in Congress. I’m looking for volunteers to go see their elected officials with this information. thank you Vickery sharing this to Facebook whose job would it be one wonders if fact checking wouldn’t be the editors of a newspaper ? “all the news that fits we print we didn’t say anything about it being based on facts !” Did Jeri Clausing go on to write comic books ? The truth is I for one hope so ! You are indeed better than the welfare rancher lovers at Forbes. I enjoy seeing your posts and always appreciate your fact checking…..very few journalists anymore even know what fact checking is! Thank you Vickery. It seems common knowledge that we can not trust the news media to give unbiased, intelligent, truthful reporting. Politicians lie, about each other during campaigns, about themselves, during campaigns. Government agencies lie, about the use of funds, about the big interest groups they ultimately are serving. The lies go on and on. On this issue of horse slaughter, you are a source of truth. In this day of video reporting, youtube access, the proof is in the pictures, and still they lie. The BLM roundups of our wild horses are horrific. The helicopter pilots should be charged with animal abuse. The “wranglers” and their handling of the wild horses should be charged with abuse. The BLM lies about the need to round up the wild horses, they lie about the numbers of horses still on the range, and they lie about the reason they are trying to eliminate the wild horses. The latest BLM committee meeting was an insult to our intelligence. Money was spent on a study to determine if the wild horses being held in pens needed shade….They knew the meeting was viewed by the public and had no shame as to the ridiculousness, the blatant waste of time and tax payer funds. There is no accountability. The BLM sends wild horses to slaughter. They deny it, even though the proof is there. What the BLM is doing to the wild horses is heartless, unnecessary, against the law, animal abuse, destroying our public lands, and putting a burden on society to try to care for the wild horses after they round them up. The reasons the BLM is trying to eliminate the wild horses, the motives are public knowledge, and still we cannot stop them. One man, Mr. Bundy was able to rouse public opinion enough to get a strong reaction. For so many years 1000’s of us who want the BLM to be held accountable have had little impact. You are one of a few voices that publish the truth. Do not be silenced. Vickery, God bless you Speaking as just one little peon, I appreciate you very much. I have implicit faith and trust in you and your God-given talent for seeking out and spreading the truth. You have that right, and we have the right to hear it. The old days of reporters digging up the truth and actually reporting it are over. Newspapers and TV news and online news companies are owned by people who benefit financially by sharing stories, not real news. They are not really news agencies anymore. Going to have to stop expecting that. It reminds me of Winston in 1984 when he was changing the news in the newspaper according to whatever benefitted those in charge wanted that day. But we still do have power because of being able to share information on the Internet. (Unless they get their way there–read up on net neutrality if you haven’t already.) What about Daily Kos? Reddit? There must be other places. Perhaps when you submit articles to places like Huffington Post and Mother Jones, you need to rewrite them? No offense because I think you’re great and talented, but could it be the delivery and not the content? I’m a big horse lover so this is one of my issues and I follow it, but if I was the average person, I would probably lose interest after a couple of paragraphs. It’s a little dry, for lack of better description due to I just woke up and haven’t had my coffee yet! That may piss you off. It would piss me off as a writer. We want everyone to agree with our point of view and get it. But sometimes I have to rewrite a story ten times and resubmit it to ten places before it gets published and it has nothing to do with content. Sometimes we have to dress the pig up. Just an idea. I want you to get this out there. Fact checking a “dry subject”? Really? Definitely. Look at what gets people’s attention nowadays. They want instant gratification. They want fluff and highs. Well, just think about FOX News. Do people really want the facts or do they want to be entertained? I guess it’s really nothing new but it has gotten worse. Or maybe it’s simply probably what we both fear the most–the news agencies are all bought. Either way, it’s pretty scary. Have you looked into TV? What about something like Rachel Maddow? She really likes to dig. I don’t know, just trying to help. The AP has always been this way. If the Supreme Court rules in favor in lying in Political Advertising (which is so against the myriad ‘Truth in Advertising’ statutes) then the AP and all Journalists can just concoct their own stories exactly like ‘Jayson Blair’. Reputable news media, that represents itself as such, obviously needs to have the *facts checked on what they are reporting. And obviously, this should go without saying. However, we now have the information that much of our news media does NOT fact check. This is a disservice to the reader, & very likely, a service to those who need to influence what is being written. Ms. Vickery Eckhoff painstakingly checks facts, however detailed, & reports, writes on such. She does not just sit down at the computer & write off this & that in a few minutes. She has tried many times to have certain news organizations verify what they have written, most notably the AP! A worst case, but there are others. The misinformation given out by sloppy, disreputable writers & media organizations is manipulation of the public. It is sage advice, “Don’t believe everything you read,” but a majority of the public does trust & believe the written word. The news needs to be held accountable for every word published. It is more than frightening that this is not happening. Thankfully, we have writers such as Ms. Eckhoff who write the truth, with the written FACTS included *in *the *same *article, to verify all she writes. I am so looking forward to reading more & more written by Vickery Eckhoff. Integrity. A moral person. Thank you so much, Ronnie Greene, and other commenters here. I am so grateful for your words here! My heartfelt thanks, to each of you! !